The Rad26/Rad3 complex in fission yeast detects genotoxic insults and initiates the cell cycle arrest and recovery activities of the DNA damage checkpoint. To investigate how the Rad26/Rad3 complex performs these functions, we constructed and characterized Rad26-GFP. Rad26-GFP localized to approximately six nuclear dots in cycling cells. 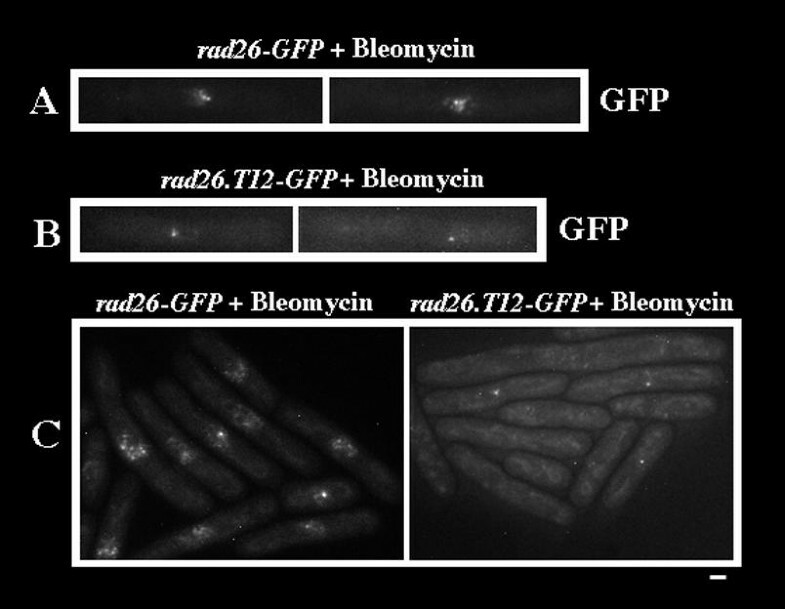 Following treatment with a DNA damaging agent, Rad26-GFP localization changed. Damaged cells contained one or two bright Rad26-GFP spots, in addition to smaller, more numerous Rad26-GFP speckles. Genetic analyses demonstrated that these Rad26-GFP patterns (dots, spots and speckles) were unaffected by null mutations in other DNA damage checkpoint genes, including rad3+. Data obtained with our Rad26.T12-GFP fusion protein correlate spots with cell cycle arrest activities and speckles with DNA repair activities. In addition, physiological experiments demonstrated that rad26Δ and rad3Δ alleles confer sensitivity to a microtubule-depolymerizing drug. We have discovered three distinct Rad26-GFP cellular structures. Formation of these structures did not require other checkpoint proteins. These data demonstrate that Rad26 can respond to genotoxic insult in the absence of Rad3 and the other checkpoint Rad proteins. The DNA damage checkpoint of eukaryotic cells helps ensure that DNA damage is repaired before it causes permanent, genetic alterations [1–3]. To accomplish this, the checkpoint monitors the genome for damaged DNA. Once damage is sensed, the checkpoint delays the cell cycle to allow DNA repair enzymes sufficient time to execute their activities. Evidence also shows that checkpoint proteins interface with DNA repair enzymes . The importance of this genomic surveillance pathway in humans is underscored by the discovery that mutated DNA damage checkpoint genes are associated with an increased incidence of cancer [5–7]. Many components of the DNA damage checkpoint have been isolated in yeast genetic screens designed to identify mutants that continued cell cycle progression in the presence of DNA damage [8–14]. Combined with recent genetic and biochemical data, it is now understood that the DNA damage checkpoint is a signal transduction cascade containing sensor, transducer and receiver proteins . In fission yeast, the checkpoint rad+ genes (hus1+, rad1+, rad3+, rad9+, rad17+ and rad26+) and chk1+ manage the sensing and transducing operations of the DNA damage checkpoint [1, 16]. Current data suggest that the Rad26/Rad3-kinase complex initially senses DNA damage by an unknown mechanism . This response leads to an increase in the kinase activity of the complex , which phosphorylates and activates the transducing protein kinase, Chk1 . Finally, Chk1 delays mitotic entry by targeting Cdc25 and Wee1, regulators of cyclin-dependent kinase activity [20–22]. Hus1, Rad1, Rad9 and Rad17 facilitate Rad26/Rad3-dependent phosphorylation of Chk1. For instance, they are dispensable for DNA damage-dependent activation of the Rad26/Rad3-kinase complex , but are required for the Rad3-dependent phosphorylation of Chk1 . Structural predictions of Hus1, Rad1 and Rad9 have led to the proposal that all three fold similarly to the subunits of Proliferating Cell Nuclear Antigen (PCNA) [24–26]. Consistent with these predictions, PCNA exists as a homotrimer  while Hus1, Rad1 and Rad9 all interact and possibly form a heterotrimer [25, 28]. In addition, Rad17 has sequence similarity and physical interactions with subunits of Replication Factor C (RFC) [29, 30]. Based on the RFC-PCNA paradigm, the Rad17-RFC complex may load the PCNA-like Rad9-Rad1-Hus1 (9-1-1) complex onto genomic lesions discovered by the Rad26/Rad3 complex. From this location, the 9-1-1 complex may link the Rad26/Rad3 complex with Chk1. Rad3 is a member of the phosphoinositide 3-kinase related kinase (PIKK) family . These proteins are large (> 200 kDa) and share a domain related to the catalytic domain of phosphoinositide 3-kinases (PI-3 kinases). However, unlike PI-3 kinases, PIKKs are not known to phosphorylate lipids but do possess protein kinase activity. Other PIKK family members also function to orchestrate eukaryotic genotoxic stress responses, including human ATM, ATR, and DNA-dependent protein kinase (DNA-PKcs), TEL1 and MEC1 of Saccharomyces cerevisiae, Mei-41 of Drosophila and UVSB of Aspergillus nidulans [5, 32–34]. Rad26 is a regulatory subunit of the Rad26/Rad3 complex that is required for Rad3 kinase activity . 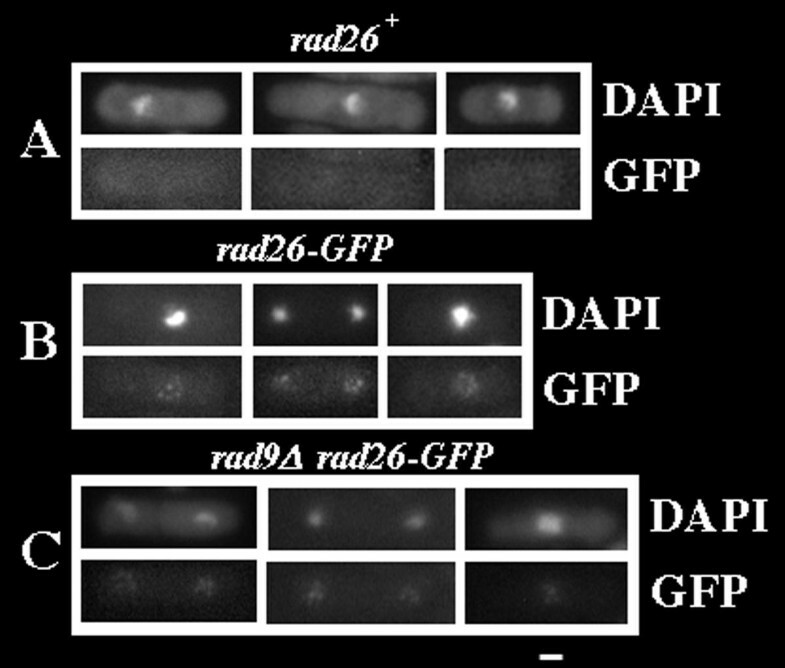 Following DNA damage, Rad26 undergoes Rad3-dependent phosphorylation . Rad26 is a 70 kDa protein containing little informative sequence information beyond a predicted coiled-coil region and a basic stretch that resembles a nuclear localization signal [13, 32]. Functionally conserved proteins with very weak sequence similarity have been found in human (ATRIP) , S. cerevisiae LCD1 (aka DDC2 and PIE1) [36–38] and A. nidulans (UVSD) . Rad26/Rad3-like complexes also exist in budding yeast and human. In budding yeast, LCD1Rad26 physically interacts with MEC1Rad3 and is phosphorylated by MEC1Rad3 following DNA damage [36, 37]. Likewise, human ATRIPRad26 physically interacts with ATRRad3 and also undergoes DNA damage-dependent phosphorylation by ATRRad3 . However, Rad26 is required for Rad3 kinase activity in fission yeast , but LCD1Rad26 is not required for MEC1Rad3 kinase activity  while ATRIPRad26 is required for normal ATRRad3 expression . Thus, the role of the Rad26-related proteins can differ among organisms. The checkpoint system in fission yeast also allows cells to recover from checkpoint-induced cell cycle arrest [9, 39, 40]. Together with the other Checkpoint Rad proteins, the Rad26/Rad3 complex controls this genetically defined pathway that likely regulates DNA repair activities. For instance, rad26.T12 cells undergo checkpoint-induced cell cycle arrest, but lose viability upon re-entry into the cell cycle . The rad26.T12 mutation acts by reducing the stability and activity of the Rad26/Rad3 checkpoint complex , suggesting that cell cycle arrest requires only a pulse of Rad26/Rad3 kinase activity while recovery may require more. Therefore, quantitative differences in the kinase activity of the Rad3/Rad26 complex may direct the cell cycle arrest and recovery pathways. Here, we investigated how the Rad26/Rad3 complex detects DNA damage. Using a Rad26-GFP fusion protein, we found that the nuclei of cycling cells contained, on average, six Rad26-GFP dots of low fluorescent intensity. Combined with our observations that rad26Δ and rad3Δ cells are sensitive to a microtubule depolymerizing drug, we speculate that the Rad26/Rad3 complex may associate with heterochromatin. Following treatment with the DNA damaging agent Bleomycin, we observed two different patterns of Rad26-GFP fluorescence. Nearly all nuclei (95%) contained small, numerous Rad26-GFP speckles, and roughly 50% of these nuclei also contained one or two very bright Rad26-GFP spots. Results obtained with a Rad26.T12-GFP fusion protein suggest that the speckles are linked to repair activities, and the bright spots play a role in checkpoint-dependent cell cycle arrest. Furthermore, these Rad26-GFP localization patterns appeared normal in hus1Δ, rad1Δ, rad9Δ, rad17Δ, and rad3Δ backgrounds. Therefore, Rad26 can orchestrate early events of the DNA damage checkpoint pathway without these proteins, including its catalytic partner Rad3. Rad26 is a regulatory subunit of the Rad3 checkpoint kinase . To investigate the cellular distribution of Rad26, we used a one step PCR-based gene-modification method  to fuse GFP (S65T) to the C-terminus of the genomic copy of rad26+. The Rad26-GFP fusion protein maintained proper checkpoint function following hydroxyurea (HU) and Bleomycin treatments (data not shown). Since the background fluorescence in live, cycling cells was too high to derive conclusions about Rad26-GFP localization (data not shown), we prepared cells using a technique previously described in a study of fission yeast chromatin binding proteins . An asynchronous population of cycling cells was first permeabilized using Zymolyase (Seikagaku Corp., Tokyo), then extracted with 1% Triton X-100 and finally fixed with methanol. We did not observe GFP-fluorescence in negative-control, rad26+ cells (Figure 1A). 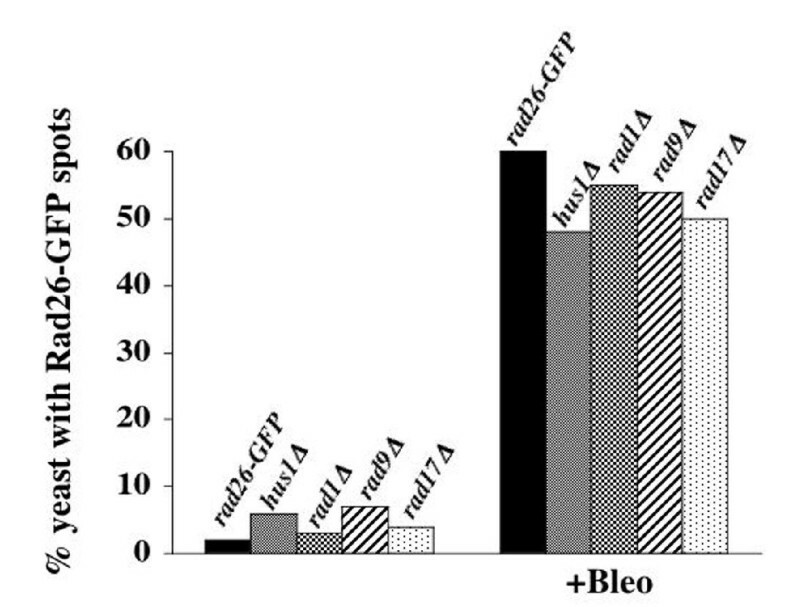 However, rad26-GFP cells contained four to eight nuclear GFP dots (six on average, N = 100; Figure 1B). Non-extracted rad26-GFP cells, prepared in an otherwise identical manner, retained this GFP-fluorescence pattern (data not shown). We also obtained similar results using paraformaldehyde fixation, however in this case non-specific cytoplasmic background fluorescence was higher (data not shown). Next, we tested if Rad26-GFP localization to dots in cycling cells depended upon the Checkpoint Rad proteins. 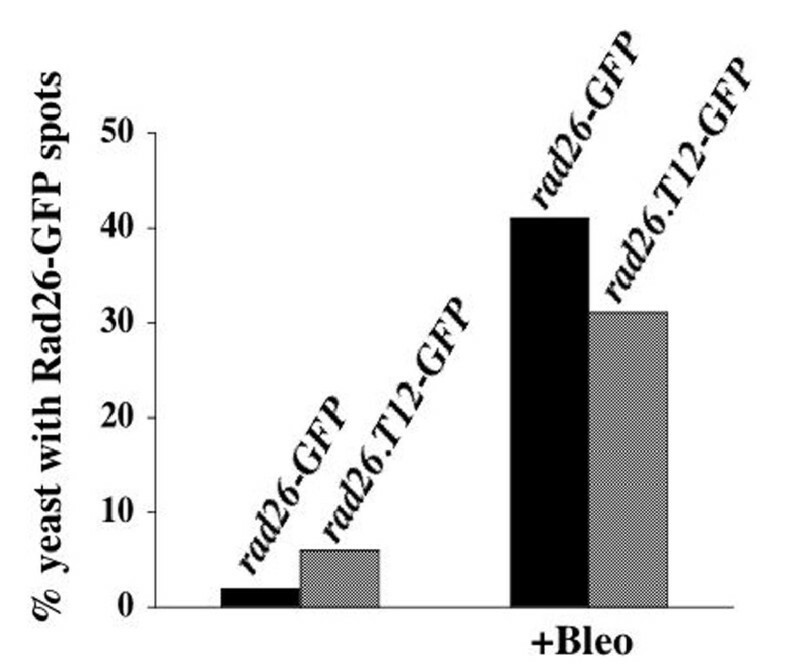 The rad26-GFP allele was crossed into five checkpoint radΔ alleles (hus1Δ, rad1Δ, rad9Δ, rad17Δ and rad3Δ) and Rad26-GFP localization was assayed in Triton X-100 extracted cells. None of the checkpoint radΔ alleles affected Rad26-GFP localization in cycling cells, although we did observe a slight decrease in the intensity of the fluorescence signal in these genetic backgrounds (rad9Δ, rad26-GFP cells are shown in Figure 1C; hus1Δ, rad1Δ, rad17Δ and rad3Δ cells containing rad26-GFP are not shown). Therefore, the checkpoint Rad proteins are not required for proper localization of Rad26-GFP in cycling cells. Three pieces of evidence suggest that Checkpoint Rad proteins are physically associated with heterochromatin. First, Rad26 and Rad3 are required to maintain proper telomere structure and telomere-associated gene silencing . Second, chromatin-immunoprecipitation (ChIP) experiments demonstrate that over-expressed Rad3-HA exists at telomeres . Third, Triton X-100 extraction, shown previously to remove non-chromatin bound proteins , failed to disrupt the Rad26-GFP dots in the nuclei of cycling cells (see Figure 1). Physiological experiments can also be used to characterize heterochromatin-binding proteins . For example, absence of Swi6 in fission yeast sensitizes cells to thiabendazole (TBZ), a microtubule depolymerizing drug . Presumably this occurs because absence of Swi6 disrupts centromeric heterochromatin and, as a result, sensitizes cells to drugs that compromise spindle function. To test whether checkpoint mutants are sensitive to microtubule depolymerization drugs, we spotted serial dilutions of cultures on plates containing 20 mg/ml TBZ. 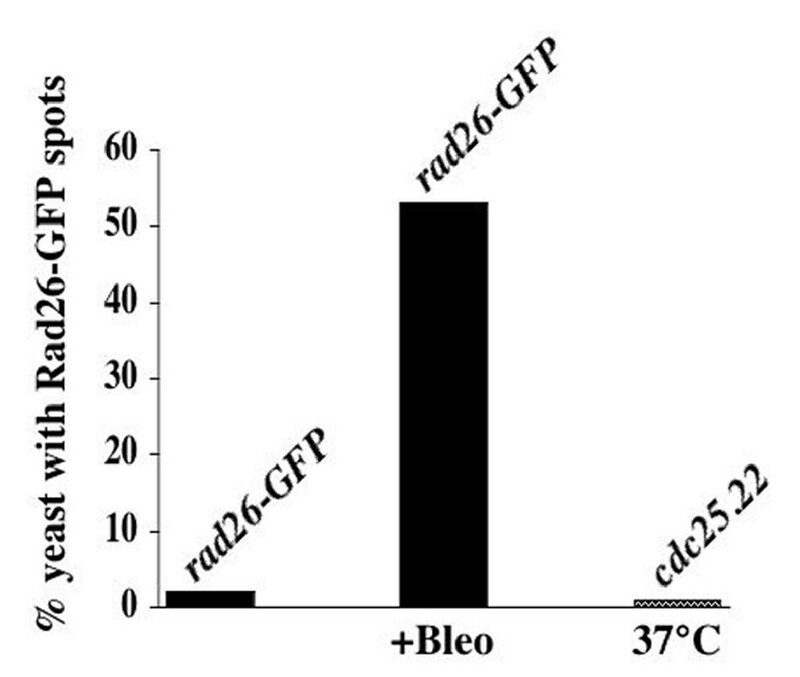 As shown, both rad26Δ and rad3Δ cells were sensitive to TBZ (Figure 2). Mutations that disrupt the microtubule cytoskeleton are also known to sensitize cells to TBZ . However, using anti-tubulin immunofluorescence, we did not discover any gross microtubule cytoskeletal abnormalities in rad26Δ and rad3Δ cells (data not shown). These data lead us to speculate that the Rad26/Rad3 complex possibly associates with centromeric heterochromatin in cycling cells. We are currently testing this hypothesis. rad26Δ and rad3Δ are sensitive to TBZ. Cultures were grown at 30°C in liquid, complete media to 1 × 106 cells/ml. Two-fold serial dilutions of cultures were made onto complete agar media (YE5S) and complete agar media containing 20 μg/ml TBZ (20 μg/ml) and incubated at 30°C. 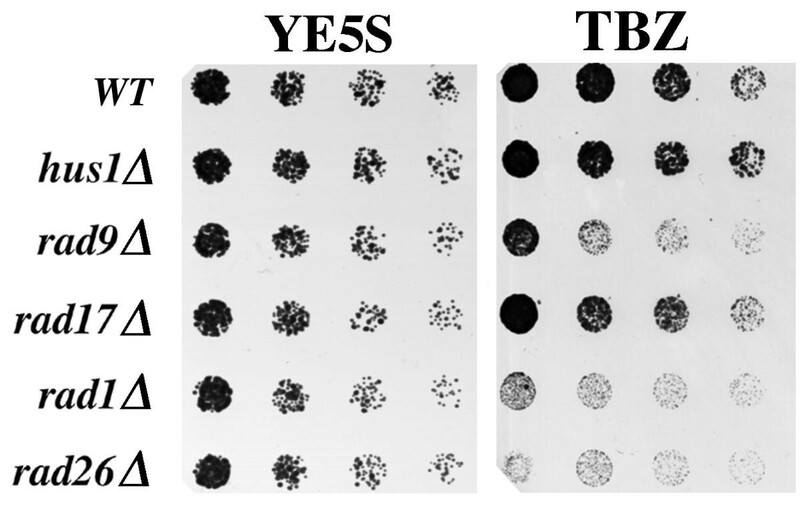 Pictures of YE5S plates were taken after two days of growth, while those of YE5S + 20 μg/ml TBZ plates were taken after four days. Wildtype (TE696), rad26Δ (TE257), rad26.T12 (TE1102) and rad3Δ (TE890). Strains carrying the rad26.T12 mutation undergo cell cycle arrest following treatment with a DNA damage agent, but lose viability upon re-entry into the cell cycle [13, 40]. We found that the rad26.T12 strain is significantly less sensitive to TBZ than rad26Δ and rad3Δ (Figure 2). Therefore, deficiencies in the recovery activities of Rad26 are not related to this TBZ-phenotype. Next, we tested if the four other checkpoint radΔ alleles (hus1Δ, rad1Δ, rad9Δ and rad17Δ) conferred TBZ sensitivity (Figure 3). Interestingly, rad9Δ and rad1Δ, but not rad17Δ and hus1Δ, shared this phenotype. Since each of the checkpoint rads is an essential component of the checkpoint, TBZ sensitivity can not be the indirect result of defects in the checkpoint response. hus1Δ and rad17Δ are not sensitive to TBZ. Cultures were grown at 30°C in liquid, complete media to 1 × 106 cells/ml. Two-fold serial dilutions of cultures were made onto complete agar media (YE5S) and complete agar media containing 20 μg/ml TBZ (20 μg/ml) and incubated at 30°C. Pictures of YE5S plates were taken after two days of growth, while those of YE5S + 20 μg/ml TBZ plates were taken after four days. Wildtype (TE696), hus1Δ (TE484), rad9Δ (TE794), rad17Δ (TE864), rad1Δ (TE459) and rad26Δ (TE257). The kinase activity of Rad3 is essential for checkpoint signaling and is the only known biochemical function of this 220 kDa protein [48, 49]. The rad3.a strain has an amino acid change (D2230A) in the conserved kinase domain of Rad3 that eliminates cell cycle arrest in response to DNA damaging agents [48, 49]. Interestingly, we found that the rad3.a strain is less sensitive to TBZ than the rad3Δ and rad26Δ strains (Figure 4). Therefore, TBZ sensitivity is caused by more than loss of Rad3-kinase activity alone. rad3Δ is more TBZ sensitive than rad3.a. Cultures were grown at 30°C in liquid, complete media to 1 × 106 cells/ml. Two-fold serial dilutions of cultures were made onto complete agar media (YE5S) and complete agar media containing 20 μg/ml TBZ (20 μg/ml) and incubated at 30°C. 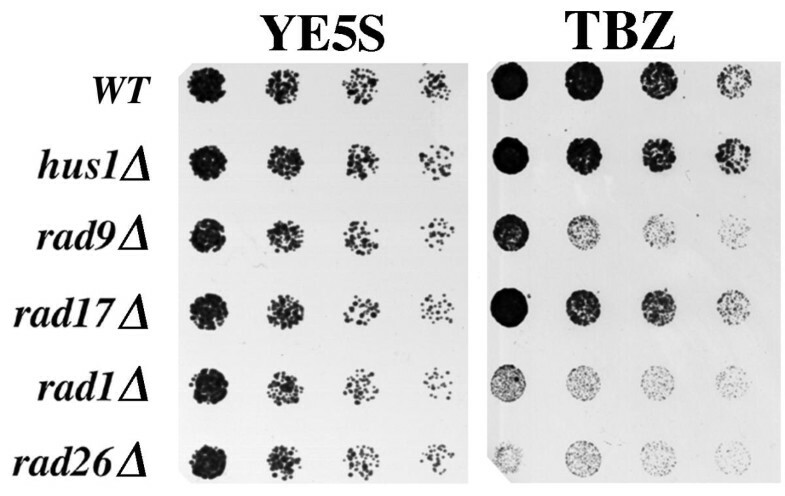 Pictures of YE5S plates were taken after two days of growth, while those of YE5S + 20 μg/ml TBZ plates were taken after four days. Wildtype (TE696), rad26Δ (TE257), rad3Δ (TE890) and rad3.a (TE571). To test if Rad26-GFP localization changes in response to DNA damage, a culture of rad26-GFP cells was grown to mid-log phase (optical density 0.3) and then treated with Bleomycin, a radiomimetic drug, for 3 hours before fixation and DAPI staining. The rad26-GFP cells underwent a normal, checkpoint response following Bleomycin treatment and arrested cell cycle progression with one nucleus in a long cell (Figure 5A). We observed two distinct patterns of GFP-fluorescence in these treated cells. First, nearly every cell (95%) contained many small foci that we call speckles (Figure 5A). These speckles are different than the larger, less numerous dots (6 on average) that we observed in untreated, cycling cells (compare Figure 1B with Figure 5A). Second, approximately half of Bleomycin-treated cells also contained one or two bright, nuclear spots (Figure 5B; arrow denotes the speckles that formed in these cells). We found that 2% of untreated, cycling rad26-GFP cells contained one or two Rad26-GFP spots, while 55% of Bleomycin treated, rad26-GFP cells formed these spots (Figure 6). Since we also observed these spots in live, Bleomycin-treated rad26-GFP cells (data not shown), these results were not affected by methanol fixation. Furthermore, both spots and speckles formed within 30 minutes of Bleomycin addition (data not shown). These data show that speckles and one or two bright, nuclear Rad26-GFP spots form in Bleomycin-treated cells. These changes in Rad26-GFP localization could be a direct response to the DNA damage caused by Bleomycin treatment, or an indirect consequence of G2/M cell cycle arrest that occurs after checkpoint-activation. The cdc25+ gene encodes a positive mitotic regulator  that is also a target of DNA damage checkpoint signaling . At the restrictive temperature (37°C), the temperature-sensitive cdc25.22 allele causes cells to arrest at the G2/M boundary . To test if these Bleomycin-induced patterns of Rad26-GFP fluorescence formed as an indirect consequence of cell cycle arrest, we crossed the cdc25.22 mutation into a rad26-GFP background. A cdc25.22 rad26-GFP strain was isolated and grown to mid-log phase before shifting to the restrictive temperature for 3 hours. This caused the cells to arrest cell cycle progression with a single nucleus in a long cell (data not shown), but did not increase the formation of Rad26-GFP spots (Figure 6) or speckles (data not shown). These data suggest that both patterns of Rad26-GFP fluorescence (spots and speckles) occur as a result of DNA damage, as opposed to the checkpoint-induced G2/M cell cycle delay that follows Bleomycin treatment. Next, we tested if these patterns of Rad26-GFP fluorescence formed in other checkpoint radΔ cells. Similar to results obtained in a wild-type background, we observed that between 48% and 56% of checkpoint radΔ cells formed one or two bright, Rad26-GFP spots following Bleomycin treatment (Figures 5C and 7). We also observed that some of these cells contained Rad26-GFP speckles (arrow in Figure 5C). However, the Rad26-GFP signal in radΔ cells was slightly weaker than what we observed in a rad+ background (compare Figure 5C with 5A and 5B), and we were unable to confidently determine the efficiency by which radΔ cells formed Rad26-GFP speckles following DNA damage. An elevated number of untreated, cycling checkpoint radΔ cells contained one or two bright Rad26-GFP spots. While 2% of untreated rad26-GFP cells contained these spots, between 3% and 7% of untreated, checkpoint radΔ cells formed them (Figure 7). The spots may form in response to spontaneous DNA damage that can arise during a typical cell cycle, and the absence of Hus1, Rad1, Rad3, Rad9 or Rad17 may increase these events. We also tested if Rad3 kinase activity was required for re-localization of Rad26-GFP following Bleomycin treatment. However, neither the rad3.a nor a rad3Δ allele significantly affected the ability of Rad26-GFP to form the bright foci following Bleomycin treatment (Figure 8). Therefore, Rad26 can respond to DNA damage in the absence of Rad3. Rad26 functions in checkpoint cell cycle arrest and recovery pathways. A mutant allele, rad26.T12, genetically separates these functions, since rad26.T12 cells can undergo checkpoint-induced cell cycle arrest but fail to recover and lose viability [13, 40]. To determine if spots and speckles are associated with these different Rad26 functions, we tagged the C-terminus of Rad26.T12 with GFP using the same primers and method that we used to tag Rad26 (see Methods). After confirming that the rad26.T12-GFP strain behaved similarly to a rad26.T12 strain in response to both Bleomycin and HU (data not shown), we investigated Rad26.T12-GFP localization following Bleomycin treatment. We observed that bright spots formed in both rad26-GFP and rad26.T12-GFP cells that had been extracted with Triton X-100 prior to microscopy (Figure 9, Figure 10A and 10B). We also observed speckles in rad26-GFP cells (Figure 10A) but did not identify these structures in Bleomycin-treated rad26.T12-GFP cells (Figure 10B). Likewise, both spots and speckles formed in paraformaldehyde-fixed rad26-GFP cells, while only spots formed in rad26.T12-GFP cells (Figure 10C). These data link the bright, Rad26-GFP spots with the cell cycle arrest activities of the DNA damage checkpoint, and suggest that Rad26-GFP speckles play a role in recovery. The Rad26/Rad3 complex plays a critical role in the checkpoint response to DNA damage in fission yeast. Here, we studied the cytological events that may be associated with these functions of the complex. In normal cycling cells, Rad26-GFP localized to between 4 – 8 dots (Figure 1B). 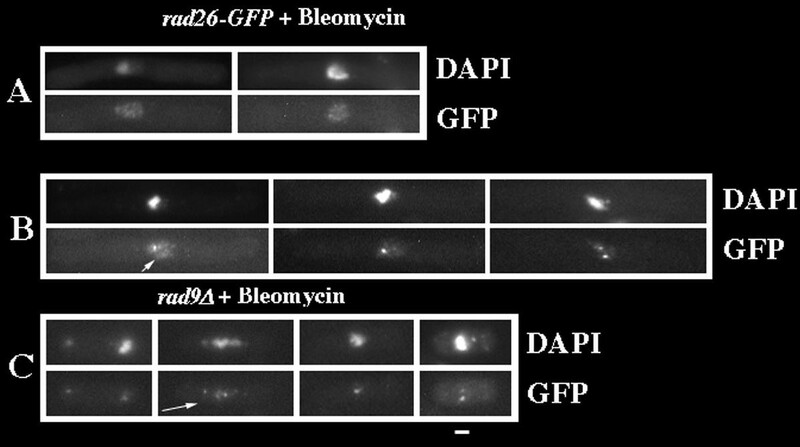 After DNA damage, Rad26-GFP localized to numerous smaller foci called speckles (compare Figures 1B and 5A). Approximately half of these damaged cells also contained one or two bright Rad26-GFP spots (Figure 5B). In this discussion we consider the location and function of these distinct, cytological structures. For technical reasons we were unable to conclusively identify these structures (Figure 1B), but for a number of reasons we believe that they may be associated with sites of heterochromatin. First, the Rad26-GFP dots were resistant to an extraction method that was developed to specifically-preserve the localization of chromatin-binding proteins . Secondly, we discovered that the rad26Δ strain is sensitive to TBZ, a phenotype common to mutants that disrupt centromeric-heterochromatin . Finally, fission yeast has a relatively small number of heterochromatic regions (3 centromeres, 6 telomeres, and 1 mating-type locus; [53, 54]) and the number of Rad26-GFP dots we observe is roughly consistent with localization to these regions. In addition, other studies have revealed a functional role for checkpoint Rad proteins in telomere maintenance [43, 44], while one has shown that an over-expressed, epitope tagged version of Rad3 associates with telomeric DNA . It will be interesting to determine if checkpoint proteins have a role in centromere function, or mating-type silencing, both of which require intact heterochromatic structures. Alternative explanations exist. For example, the microtubule cytoskeleton has been implicated in recombination-dependent DNA repair processes in budding yeast . The TBZ-sensitivity of DNA damage checkpoint mutants, such as rad26Δ and rad3Δ, may indicate that checkpoint proteins cooperate with the cytoskeleton during such repair. The TBZ sensitivity assay identifies distinct functions of checkpoint Rad proteins. In particular, rad1Δ and rad9Δ are also sensitive to TBZ, while rad17Δ and hus1Δ are not (Figure 3). Studies suggest that Hus1, Rad1, and Rad9 function together to form a PCNA-like clamp complex that is loaded onto DNA by Rad17 . This model predicts that all four proteins should show the same levels of TBZ sensitivity since deletion of any of the four proteins should prevent formation of a functional clamp. The TBZ-data shown here suggest that at least Rad1 and Rad9 have roles that are independent of their function in the PCNA-like clamp. In addition, we found that rad3.a, a mutation that disrupts Rad3 kinase activity, confers less TBZ sensitivity than a rad3Δ allele (Figure 4). To our knowledge, this is the first study to detect physiological differences between a kinase-dead allele of rad3+ and a full deletion. This demonstrates that Rad3 has a biochemical activity in addition to its catalytic kinase activity. TBZ sensitivity may reveal a novel role for checkpoint Rad proteins that is independent of the DNA damage checkpoint response. Alternatively, some structure that is required to prevent TBZ sensitivity, such as centromeric heterochromatin, may function in checkpoint control. Possibly, the Rad26/Rad3 complex localizes to regions of heterochromatin (centromeres, telomeres and the mating type loci) in undamaged cells. From these vantage points, the Rad26/Rad3 complex may survey the entire genome for DNA damage. For example, heterochromatin functions in the organization of chromatin, the cohesive force existing between chromatids, and the tension on chromosomes produced by the spindle apparatus [56, 57]. DNA damage may produce changes in these elements. By localizing to heterochromatic regions, the Rad26/Rad3 complex possibly monitors such elements to perceive DNA damage on a genome-wide scale. Within thirty minutes of Bleomycin treatment, the Rad26-GFP dots found in cycling cells were replaced by speckles and spots (Figures 5A and 5B). Both of these Rad26-GFP patterns were absent from G2/M arrested cdc25.22 rad26-GFP cells (Figure 6), so they likely resulted from Bleomycin-induced DNA damage as opposed to checkpoint-induced cell cycle arrest. 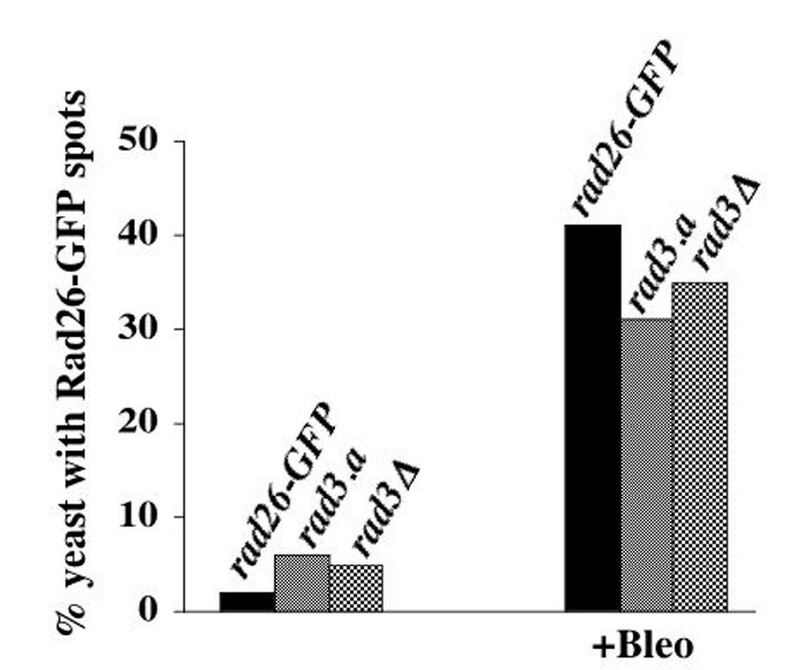 Also, both types of Rad26-GFP patterns formed independently of the other checkpoint Rad proteins (Figures 5C and 7), and did not require Rad3 kinase activity or Rad3 (Figure 8). Together, these analyses suggest that the cytological changes of Rad26-GFP are very early steps in the process of checkpoint activation that are directed entirely by Rad26. Interestingly, speckle formation was compromised in Bleomycin-treated rad26.T12-GFP cells, which are cell cycle arrest-proficient but recovery-deficient (Figure 10). In contrast, formation of the Rad26.T12-GFP spots occurred normally after Bleomycin-treatment (Figures 9 and 10). These results suggest that the speckles could be associated with DNA repair and recovery activities, while the spots could be associated with cell cycle arrest. Following ultraviolet radiation of HeLa cells, paraformaldehyde fixation and Triton X-100 extraction, Cortez et al. found that ATRIPRad26 and ATRRad3 also re-localize to a large number of intranuclear foci. DNA repair activities may take place at these foci since BRCA1 has been shown to co-localize with ATR in damage-induced foci . Using elegant methods to test for direct association of DNA damage checkpoint proteins at double strand breaks in vivo, other groups have shown that MEC1Rad3-HA and LCD1Rad26-GFP localize to sites of DNA damage [59, 60]. However, MEC1 was required for this re-localization of LCD1-GFP in vivo . Thus, while re-localization of Rad26/Rad3-related complexes to sites of DNA repair may be evolutionarily conserved, the regulation of these complexes is not. Unlike ATRIP and LCD1-GFP, Rad26-GFP also localizes to one or two bright spots following DNA damage (Figure 5). We speculate that these spots could represent "control centers" where various kinds of information about the status of the genome is integrated with cell cycle progression in fission yeast. We tested if these spots were associated with the spindle pole body (SPB), given that an ultimate receiver of the checkpoint signal, Cdc2, resides at the SPB prior to mitosis in fission yeast . However, these Rad26-GFP foci did not co-localize with a SPB marker, Sad1 (data not shown) . We have discovered three distinct Rad26-GFP cellular structures. Since formation of these structures did not require other checkpoint proteins, including Rad3, we believe that they represent very early steps in the checkpoint response to damaged DNA that may be controlled entirely by Rad26. In normal cycling cells, Rad26-GFP localized to a small number of dots that may function as surveillance centers and monitor the genome for DNA damage. After damage, Rad26-GFP localization to speckles may correspond to the direct interaction of Rad26 with sites of damage. At the bright spots, Rad26 may integrate various kinds of information about the status of the genome with cell cycle regulators. Further study of these structures and their regulation could provide important new information about the early steps in DNA damage detection and the checkpoint pathway. The strains used in this study (Table 1) were grown at 30°C under standard conditions  unless noted otherwise. Bleomycin (Sigma, St Louis, MO) was prepared as a 3 U/ml stock solution in water and kept at -20°C. To activate the DNA damage checkpoint, Bleomycin was added to cultures (optical density of 0.3) at a concentration of 5 mU/ml for 3 hours . Thiabendazole (Sigma) was prepared in DMSO as described previously  and added to cooled, YE5S agar prior to pouring plates. We did not observe an affect of DMSO on the growth of any strains used in this study (data not shown). To arrest the cdc25.22 rad26-GFP strain at the G2/M boundary, TE1198 was grown at 30°C in liquid, complete media to O.D. 0.3. Next, cells were collected by centrifugation and re-inoculated to the same density in pre-warmed 37°C liquid media. They were grown for 3 hours at this temperature to cause cell cycle arrest at the G2/M boundary before fixation. To observe Rad26-GFP in live cells, yeast were grown in YE5S liquid medium to an optical density of 0.5, washed three times in phosphate buffered saline (pH 7.4) and mounted on poly-L-lysine (Sigma) coated coverslips http://www.bio.uva.nl/pombe/handbook. A 4 μl volume of Slowfade Component A (Molecular Probes, Eugene, OR) was placed on the coverslips, which were finally mounted on glass slides. A Zeiss Axioskop 2 was used to observe specimens, and images were captured with the SenSys digital camera (Photometrics, Tucson, Az) and processed using IP Lab software (Fairfax, VA). To paraformaldehyde-fix cells, ~30% paraformaldehyde (Sigma) stock solution  was added to ~3% in yeast cultures for ten minutes before cells were washed and mounted on coverslips. Alternatively, cells were extracted with Triton X-100 before methanol fixation, as described previously . To visualize nuclei, 1 μg/ml 4,6-diamidino-2-phenylindole (DAPI) was added to Slowfade Component A. To observe the microtubule cytoskeletons of rad26Δ and rad3Δ, cells were processed for immunofluorescence microscopy using standard combined aldehyde (formaldehyde and methanol) fixation and TAT1 monoclonal antibodies . Two long primers (prad26forward: TATTTTCTCACTACAGAATTGTTGGAAGTTTGCGTCTCTCCCGAAGAGCTGGAGCAGTTGTACACTAATTTTCGGATCCCCGGGTTAATTAA; prad26reverse: GATGTGGGTGCGGGACGGGAAAGAACAACACTGAAGAAACAAGTATCATTATTTCATTTGAAAAATTAGGGAAATGAATTCGAGCTCGTTTAAAC) were used to amplify the GFP (S65T)-kanMX6 module of pFA6a-GFP (S65T)-kanMX6  in ten separate 50 μl PCR reactions using Accuzyme, high-fidelity polymerase (Bioline, Randolph, MA). These primers contain sequences that are homologous to those that flank both sides of the rad26+ STOP codon . By homologous integration, they direct integration of GFP (S65T) to the 3'-end of rad26+. The PCR-product was pooled, extracted with phenol:chloroform:isoamyl alcohol (25:24:1), precipitated with ethanol and dissolved in water. This DNA was then used to transform TE696 (rad26+) and TE1102 (rad26.T12) to Geneticin (Life Technologies, Rockville, MD) – resistance as described by Bahler et al. . Integrants were verified by Western blotting using anti-Rad26 polyclonal antibodies  to show that the genomic copy of rad26+ or rad26.T12 had been replaced by rad26-GFP or rad26.T12-GFP, respectively (data not shown). Rad26-GFP was followed through crosses using Geneticin-resistance and Western blotting to confirm that rad26+ was completely replaced with rad26-GFP (data not shown). We thank Iain Hagan (Paterson Institute for Cancer Research) for anti-Sad1 antibodies, Jurg Bahler (The Wellcome Trust Sanger Institute) for PCR-based tagging vectors and Keith Gull (University of Manchester) for TAT-1 monoclonal antibodies. We also thank the members of Fred Winston's laboratory for technical help, Mary Bryk for assistance with the microscope, and each of the BMC reviewers for providing helpful critiques. Finally, we thank Robert Weiss (Harvard Medical School), Fred Winston (Harvard Medical School) and Stephen Harris (University of Nebraska) for contributing to this work in many ways. This work was supported by the National Institutes of Health (GM-19773-03 to T.W. and GM-50015 to T.E. ).